Killer Characters: GIVEAWAY! GLITTER BOMB! I am so excited to be visiting Killer Characters to tell you about my adventures in GLITTER BOMB. My name is Carmela Bertrand and I own the Memory Mine Scrapbooking shop on Governor Nicholls Street in the French Quarter of New Orleans, which is the most vibrant place to live and work. And NOTHING is more exciting than Mardi Gras. Of course, sometimes it can get a little too exciting. There I was with my BFF Ava Gruiex, we were dancing, and getting ready to catch beads being thrown by the krewe of the first float in the Pluvius Parade. And what a float it was! Pluvius krewe members were hanging off the decks and swinging from the sails of a galleon ship of olden days. They were yelling and tossing golden beads by the hundreds at the roaring crowd that filled Royal Street from curb to building line. On the top deck a resplendent King Neptune sat on a golden throne. Streams of gold glitter propelled out of the prongs of his trident and shot high in the air before scattering over the float and the crowd. Ava pointed out my ex-husband waving from the float. Oh well, I could just ignore him. Suddenly there was an explosion. The float rocked and rolled. A rumbling noise grew louder. The float toppled and what looked like a thousand pounds of glitter flew everywhere, burying the krewe members who'd been tossed off the float. And when the explosion was over, one by one, the krewe stood up and shook themselves off. Much as I didn’t like being married to Shamus Meecham, I was glad to see him standing, albeit shakily. Then, I watched him walk over to a body that was lying on the ground perfectly still and covered with so much glitter that it was impossible to tell who it was. Ava and I ran over. We brushed away the glitter and the man never moved. Then I heard the sirens…Well the last thing I needed was to have my long time beau Detective Edgar Babcock find me at the scene. But there I was when he pulled up and he quickly discovered that my ex-husband was there as well. Let’s just say, Babcock isn’t always as cool as he pretends to be when he thinks I am paying too much attention to Shamus. And I had my fingers crossed that this wasn’t a murder because Babcock practically accuses me of being at every murder scene he responds to and, you know, that is patently false. Maybe most scenes, but certainly not all. I’m sure you are dying to know what happened next, so we are giving away a copy of GLITTER BOMB to one lucky commenter below. Just say a word about Mardi Gras. Anything at all. Don’t forget to include your email addy in this format: name (AT) server (DOT) com to avoid the spam bots. Giveaway closes at midnight Sunday, October 21st. I have never been to Mardi Gras but it is on my bucket list. Mardi Gras sounds like it would be so much fun, except when floats explode and there is a possible murder! I've never been to Mardi Gras or to a Mardi Gras party, BUT I've eaten king cake. :) Sounds like tons of fun and I think some of the costumes are gorgeous. Love the colors! Can't wait for the opportunity to read " GLITTER BOMB". 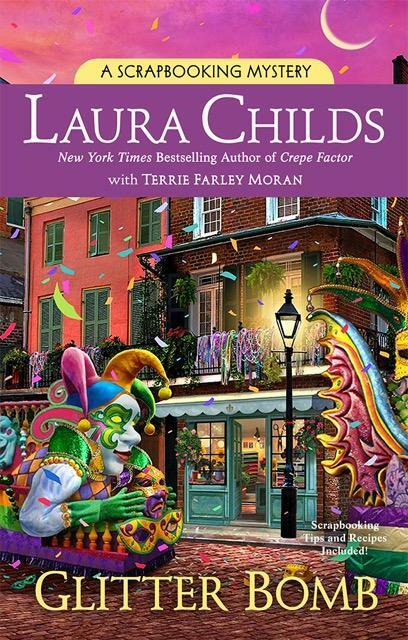 I'd love to get to know more about Carmela Bertrand and the murder at Mardi Gras. It will be interesting to find out how her ex fits into the picture. Thanks for the wonderful opportunity to win a copy! I have never been to Mardi Gras - would definitely like to go! I love the cover of this book. Would love to read it. Thanks for a chance to win it. Rose Hutton above is putting in to win the book. I'm hoping. I love the cover. Would love to read it. I have never been to a Mardi Gras event. On our bucket list to go to Madrid Gras. Thanks for the giveaway. Love the books. 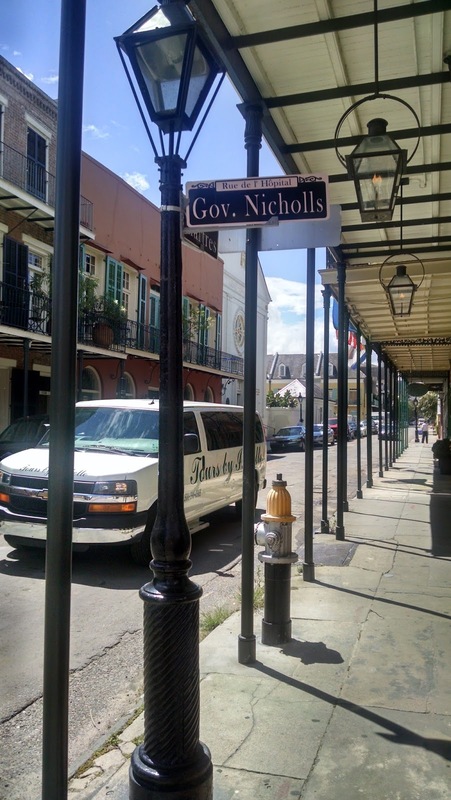 I have been to NOLA,but not during Mardi Gras. I'm sure it's a really fun time and would like to go someday. I’ve never celebrated Mardi Gras, but it sounds like a fun time. I have never been to Mardi Gras but a dear friend sent me beads from one of the parades. I still treasure them and wear them every year. I haven't been to Mardi Gras but I will put on beads and a mask to read this if I win. Haha. 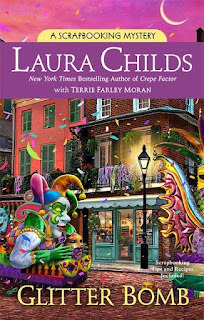 I've never been to Mardi Gras, but I love books based around it (and New Orleans in general). Loved the first 2 books in the series. Have book 3 to read, so will be starting that soon. That sounds like one heck of a float! Only to have it blow up. What a shame. I have never been to a Marti Gras in New Orleans or environs. I have been to Marti Gras themed parties (Chamber of Commerce Banquet more than once; Office party; community festival, and a birthday). I have beads in my jewelry drawer, but my mask has seen better days and I tossed it. Never been to Mardi Gras!! Mardi Gras sounds like a hoot!! I would love to go to NOLA someday!! I'd love to attend Mardis Gras some day. I’ve been to New Orleans but never for Madrid Gras. Maureen Rasmas had trouble entering so I am posting this for her. I love the Mardi Gras colors - purple, gold, and green. Those are my colors! Thanks for the chance. mackisa at gmail dot com. I've never been to Mardi Gras. I've never been to Mardis Gras. This story sounds wonderful. I was so fascinated by Mardi Gras I did a term paper on the history of it when I was in college. I visited NOLA once, but never have been to Mardi Gras. I have friends who've gone several times. It would be such fun to go! I've been to New Orleans, but not Mardi Gras. I loved New Orleans and would love someday to go to Mardi Gras! I'd love to attend a Mardi Gras one day. It would be fun. I always wanted to go to Mardi Gras, but never have. I’ve never been to Mardi Gras but it sounds like fun. Yes I have been to Mardi Gras and what a blast it always is!! I am so excited for this book!!!! Oops. MY email is beatifton@yahoo.com. My email address : vboudreau57@gmail.com. I hope I win !Thank you! I have never been to Mardi Gras but it sounds like it would be fun to see. I would be the one with no beads...I am not that boisterous. Giveaway is closed. Winner has been notified. Thanks so much to everyone for your comments. As you can tell, Laura and I love New Orleans! And the winner is Molly Laughlin. GLITTER BOMB is on its way! Congratulations Molly.